It was a typical weekend day, and I needed my flour for the week. So I drove on over to see my friend Nan at Grist & Toll. This happens to be the only place I will buy flour now, I should mention. I have tried several taste tests with various well-known/popular organic brands, and they don’t even come close to the heartiness and freshness that comes with a Grist & Toll loaf. Seriously, bakers, you have got to try it for yourselves! That day Nan also told me about a little known license called “Cottage Food.” It exists here in Los Angeles, and it enables DIY people like myself to have a little business of their own right out of their own home. “WHAT? !” I thought, how cool is that?! 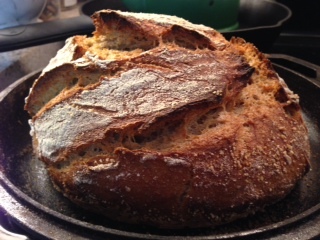 I have been baking bread and giving it to friends, but the thought of being able to use my own oven in my own home to sell to farmer’s markets and small-scale coffee shops, deli’s, etc. — now I felt like I saw a bigger dream in front of me. YES! And it was really just as simple as I thought it might be. 1. Go beyond just filing out the application. I knew that I would immediately have to have a “Class B” license, since I wanted to sell my bread at various places other than out of my own kitchen. This class is a bit more complicated, so I sent an email immediately to introduce myself, so I did not get lost in the shuffle. Later I found out that there are only about 400 of these licenses so far in Los Angeles County. You too can be part of a DIY Revolution! 2. Take photos of any and all ingredients, and include them in your correspondence (not the initial email, but once you make their acquaintance). Especially if you are using organic ingredients. They require you make labels for all of your products, and they are more strict when it comes to the use of organic products, understandably so. 3. If you don’t hear back from them, call them, email them, what have you. Not everyday, folks, but giving them a light tap or small nudge will help. They are busy people, but very nice people and they really want to see you succeed. Stay on top of it! 4. Be aware that they may text or call you the day before they wish to come and inspect your home. Be prepared! Have your place looking clean and all of your materials in their proper pantry or tucked away in the fridge. They do not allow dairy products or anything that can spoil easily. Have all of your labels and paperwork printed out, and note down any questions or concerns you may have so you can ask then and there. It is also important to keep in mind that once that year is up, they will come to inspect your home without warning. Just another reason for me to always keep my kitchen as clean as possible! I was fortunate enough to have Petros be the one to come and inspect my place. He was super helpful and accommodating. We had a lovely 30 minute discussion about bread and how the breads found on grocery store shelves in this country are not really “food” anymore. I think he may want to be a part of our Bread Revolution one day too. So, there you have it, folks. I believe some other states are starting to offer this as well. If you have any questions, please feel free to message or email me. Best of Luck on pursuing that dream! Anything is possible! !